You are the one who has been doing your best to be pure in your heart. You were always tender and brave at any moment. You are very special to your friends and of course to your family. All the things you have done gave so much courage to the people around you. You deserve all the love from your loving people around you. blessings for what you need in your life. FEAR doesn’t bring you anything. It is only an illusion that the other –darkers have made up for you. We only give you courage, happiness and dreams that will come true. Have courage to get anything you want. You are protected and secure in this universe. And now, you, let go of fear and follow your true heart of love. We only support you when you do in this way. It is NOW for you to do that. 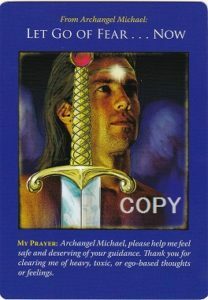 I’m Archangel Michael, and I will pass this message to you through E.Kathy.